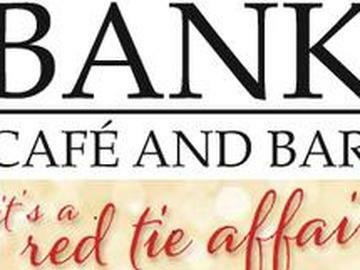 Join us at BANK Café and Bar, located within the Westin Verasa Napa hotel for our Sixth Annual Red Tie Affair New Year's Eve Gala! Beginning at 9pm, you will enjoy DJ Dancing from Nor Cal Sound, no-host bar, complimentary Petite Sweet Bites, and a Champagne Toast at Midnight to ring in the New Year. Dress to impress in your Best Red Tie Attire. PRE-SALE - Get your tickets early and save! - Tickets purchased before Thursday, December 14th are only $60. Tickets purchased on or after Thursday, December 14th are $75. Are drinks included in the ticket price? Only the Champagne Toast at midnight is included. 'No host bar' - Beer, wine, and cocktails will be available for an additional charge. Are there rooms at the Westin available for the night of the party? Yes, there is a limited number of discount rooms available to our party goers. Once you have purchased your tickets, contact mateo@latoque.com for a link to book your room. The Red Tie Affair New Year's Eve party is open to adults, age 21 and over with valid identification. The Westin Hotel Garage is for hotel guest parking only. Taking a cab or Uber is advisable as street parking will be limited. No outside food or drink is permitted. No weapons of any kind. No. The Westin Verasa Napa and BANK Café and Bar are Smoke-Free properties. There will be designated smoking spots just off property available. Printed tickets will be required for admission to the event.